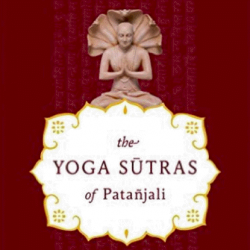 The Vibhuti Paada of the Patanjali Yoga Sutras explains the ways, means and purpose of utilizing yoga. This chapter explain the glorious properties that occur through the mastery of yoga. Sadhana, samadhi pada Patanjali shows the methodology of bringing under control the skeletomuscular body with the vital organs, the organs of action, and the senses of perception. The external mind plays the role of the 11th sense 'ekadashendriya'. This Vibhuti Paada explains the internal aspect of yoga through dharana and samadhi before going into the glories of yoga kaivalya pada. Internal aspects are internal mind (anthakarana and antharmanas), intelligence (ahankara and chitta), Dharmendriya. One pointed focus of attention with thorough thoughtfulness on a chosen point, region or a spot is dharana. This focus of attention can be done with in the body (energy points) or outside (picture or symbols).